Style Geek: [GEEK OUT] Big Hats & Lady Gaga Costumes Are In! Big Hats & Lady Gaga Costumes Are In! You know you've hit Pop Icon status when people want to dress up like you. Costume Craze proudly debuted their new officially licensed Lady Gaga costumes on their blog earlier this week. This is going to make for an interesting Halloween, especially in the gay-borhood. The full outfits run $45-57 while single accessories run $7-$17. I'm kinda drawn to the $9 Hair Bow Clip myself. FYI they're now taking pre-orders. 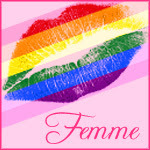 I consider myself to be a total femme. I would prefer not to get myself down and dirty, but I know sometimes it's absolutely necessary (i.e. I change my own spark plugs and fix doors @ home). I've been told I look silly holding tools, even when I know how to use them. Well, here's the perfect F*U! 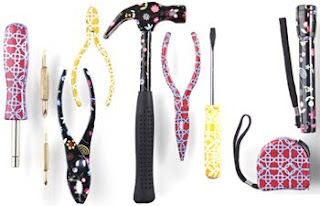 New York designer Cynthia Rowley has just rolled out a line of hardware-store staples that are too cute to pass up! Now you can do little fix-ups in style. And while people may still think you look silly, at least your shelf hangs straight. Hats Are Branching Out ~ Bye Bye Fedora? "For the last two summers, the fedora has held sway as the fashion flock’s top topper. But recently, celebs have been stepping out in floppier styles - be it for deflecting paparazzi (Mary-Kate Olsen & and pre-matrimonial Chelsea Clinton), actual sun protection (Heather Graham) or creating a character..."
I sure hope hats are headed in that direction - it would just add more drama to every day looks. 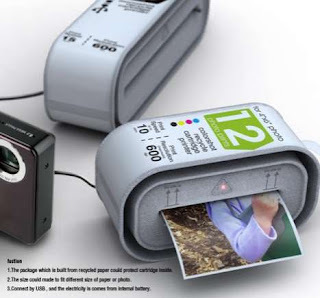 "The Instant Cartridge Printer is an interesting concept printer from design duo Yuexun Chen & Chia-Chen Hsiao. This printer lasts only as long as the ink cartridge inside it and connects to your computer via a USB cable." While the The Instant Cartridge Printer is perfect for those sudden picture-perfect moments but I need one to conveniently print receipts and invoices for my design clients. Some don't like e-mailed invoices. Another great thing is that its made from recycled milk cartons and will vary according to the paper size required. "Convenient and affordable, this awesome printer is undoubtedly a great accessory for photographers" and me! Though I can't find a price yet. I'm Going to Austin Fashion Week!! [GEEK OUT] Big Hats & Lady Gaga Costumes Are In! 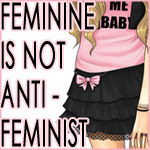 Equality Never Goes Out Of Style!